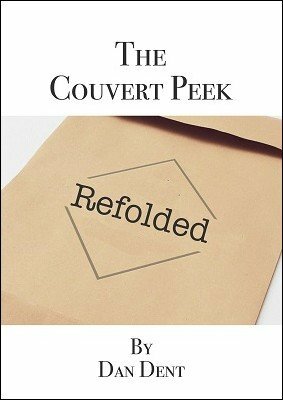 The Couvert Peek Refolded is an updated and expanded version of the original Couvert Peek manuscript (released in 2016), and now offers three version of the method: Basic, Reversed and One-Handed. An addendum copy of the new material is available to download, for free, to all those who bought the original Couvert Peek, and can be found at the same video link found in that manuscript. The Couvert Peek (pronounced Coo-ver) is a simple, deceptive and completely gimmick free Drawing Duplication effect, perfect for Close-Up and Walk-Around environments. It uses only one card (business card or plain billet), one small envelope and a pen, and offers a peek of half the inside of the folded card. A drawing is made by the spectator on the inside of a folded card. They initial a small envelope, which the performer then places the card inside. The performer proceeds to duplicate the spectator's drawing actually on the envelope itself. The card and envelope are given away to the spectator as a souvenir. All aspects and 'moves' of the routine are motivated perfectly, and elements of scripting and psychology are highlighted. The PDF contains a link to videos featuring the three different versions (as well as a free, addendum PDF for previous purchasers). The videos are to show the correct timing and rhythm of the moves, and not intended as a full tutorial of the various Peeks. 1st edition 2016, updated 2018, 17 pages + photos + video. Courvert Peek shows you how to do a drawing duplication in the most minimalist way possible using three things: a business card, a coin envelope, and a pen. Nothing is gimmicked, and both the envelope and card may be given to the spectator because you draw the dupe on the outside of the envelope with the spectator's drawing on the card sealed inside. The peek move will take a little practice to get fast and smooth. (If you do it correctly, you get a split second to make the peek.) But if you are familiar with Paul Carnazzo's stuff like his brilliant Lookout Wallet, referenced here, or PaC Stack, you will understand the workings of this quickly. This was a real treat to read. (And you get access to a very short private Youtube video which shows you just the move, both fast and slow--but not how to do it. For that you'll have to read the PDF.) If you take the time, it's cheap, simple, deceptive, and excellent, a mentalism effect that you can do anytime and anywhere. I note that creator Dan Dent gives a shout-out to Matt Mello's gimmicked Dark Arts envelope as an inspiration. I always carry a couple of those around with me to do a design duplication, but I think that I'm switching to Couvert Peek. Done well there's no downside, and there's nothing to clean up. And while the Dark Arts gimmick isn't at all difficult to make, it looks highly suspicious when compared to the ordinary, unaltered envelope of Couvert Peek. And you have to use some audience management skills with Dark Arts to keep the gimmick hidden--and you end dirty, unless you switch out the envelope. Once you get comfortable doing Dent's peek, all the dirty stuff is over before the spectator even realizes it. Highly recommended.